There is value in creating a model to understand the interactive dynamics of the elements of transformation. In a time of rising and falling fortunes, the growing stakeholder activism is going to create major communications challenges. The model helps anticipate the forces of the changing system dynamics. The strategic transformation model was created overnight in 2002 when the final editor in a series of publishing stages ask for a change in an article that I was going to publish in the Harvard Business Review. The initial proposal had been to discuss lessons learned in the effort to transform the US Postal Service. I was leaving my position as Vice President for Strategic Planning at the Postal Service to return to my private sector management consulting career. The article was ultimately named (by the Harvard Business Review)”When a Turnaround Stalls”. I learned the hard lesson that you don’t necessarily get to put a title on your own article and there are many, even most readers, for whom the title is the most important part and sometimes the only thing that they read. My personal view was very supportive of the senior management of the Postal Service that I continue to believe does an extraordinary job just to make the complex, difficult machine work as well as it does. Every night the service moves almost a half a billion pieces of mail and many local postal workers would literally be buried in the mail if they didn’t make the machines work in the night. But when I tried to get a final anecdote into the article, Word came back from the editors “Does he understand the phrase pandering?” and I found out who was running the show. Postal transformation inevitably followed a pattern that has been shaped by dozens of American icons in business that have had wholesale change in the years following the Internet Revolution and other traumatic turning points of recent years. The enterprise comes to recognize that it must change. Alternative innovations that would redefine the future are considered. A balance must be struck between the vision of the future and the traditional enterprise. 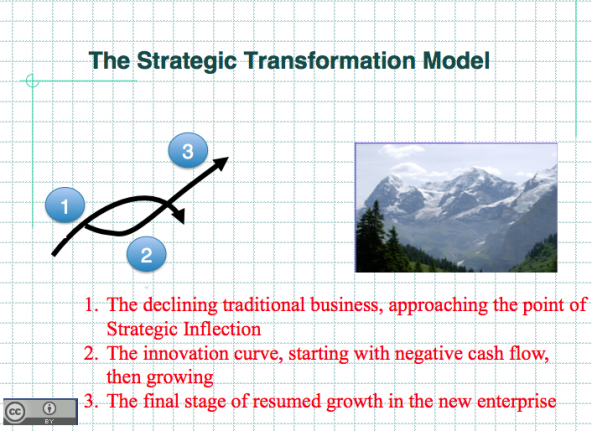 In the Strategic Transformation model above each of these three perspectives are captured and noted. In coming posts we will explore the dynamics of transformational change.